Allianz Malaysia Bhd is a diversified insurance company that provides life and general insurance in Malaysia. The vast majority of the company’s revenue is generated through insurance premiums, with the remainder stemming from investment income as well as fee and commission income. The company’s general insurance includes automotive, home, and personal insurance. Allianz Malaysia’s business insurance includes fire, engineering, and liability insurance. The company also offers life insurance through a variety of its products. Epf planning to buu this? gsi723 Big volume is changing hand from EPF to Aberdeen? EPF sell coz dividend not attractive? Undilah_DAP Why no CW issue? 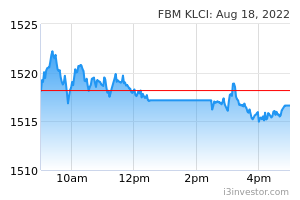 newbie4444 sifus why dividend 12 sen nia? Choivo Capital Whoever buying here, should probably note that there is the preference shares, which are convertible to normal shares one to one. Basically, the PE should be double. So if its 6 it should be 12. Manekineko Thanks for the point @ Choivo Capital. Saw it from the diluted EPS in latest AR. Mamat_Win when expected to break 14.0? Choivo Capital Don't forget to double the valuation. Because they hold half their equity in directly convertible preference shares. LouiseS dividend yield at 2.9% is lower than FD, however PE is relatively low at 6.69, worthy to investigate further. PureBULL . 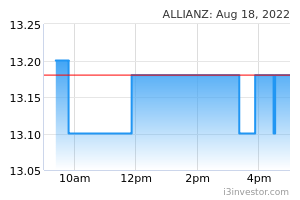 ALLIANZ, the Germany's stock to create VALUES for us all. gsi723 40c dividend already paid out one... wait next yr.
Ex7121 Next year will pay 50c dividend as management already promise to increase dividend payout every year. Guai lou very gentlemen one and will keep to their words. gsi723 sure boh, target price 4.75? by MIDF.. typing mistake? ongkkh 13.64 now ....cheap sales or coming quarter is bad?